The latest reviewed version was checked on 19 February 2019. There are template/file changes awaiting review. The Jewel Box, a group of stars in Crux constellation. Each star shows its own colour, depending on the surface temperature. The red star, DU Crucis, is the coolest of them by temperature. A star is a massive, luminous ball of plasma held together by gravity. Stars are formed within extended regions of higher density in the interstellar medium, although the density is still lower than the inside of an earthly vacuum chamber. These regions are called molecular clouds and consist mostly of hydrogen, with about 23–28% helium and a few percent heavier elements. The formation of a star begins with a gravitational instability inside a molecular cloud, often triggered by shock waves from supernovae (massive stellar explosions) or the collision of two galaxies (as in a starburst galaxy). Once a region reaches a sufficient density of matter to satisfy the criteria for Jeans instability it begins to collapse under its own gravitational force. As the cloud collapses, individual conglomerations of dense dust and gas form what are known as Bok globules. As a globule collapses and the density increases, the gravitational energy is converted into heat and the temperature rises. When the protostellar cloud has approximately reached the stable condition of hydrostatic equilibrium, a protostar forms at the core. These pre-main sequence stars are often surrounded by a protoplanetary disk. The period of gravitational contraction lasts for about 10–15 million years. Stars spend about 90% of their lifetime fusing hydrogen to produce helium in high-temperature and high-pressure reactions near the core. Such stars are said to be on the main sequence (MS) and are called dwarf stars. Starting at zero-age main sequence (ZAMS), the proportion of helium in a star's core will steadily increase. As a consequence, in order to maintain the required rate of nuclear fusion at the core, the star will slowly increase in temperature and luminosity. The duration that a star spends on the main sequence depends primarily on the amount of fuel it has to fuse and the rate at which it fuses that fuel, i.e. its initial mass and its luminosity. Large stars consume their fuel very rapidly and are short-lived. Small stars (called red dwarfs) consume their fuel very slowly and last tens to hundreds of billions of years. At the end of their lives, they simply become dimmer and dimmer. However, since the lifespan of such stars is greater than the current age of the universe (13.7 billion years), no red dwarfs are expected to have yet reached this state. As stars of at least 0.4 solar masses exhaust their supply of hydrogen at their core, their outer layers expand greatly and cool to form a red giant. After the star has consumed the helium at the core, fusion continues in a shell around a hot core of carbon and oxygen. The star then follows an evolutionary path that parallels the original red giant phase, but at a higher surface temperature. During their helium-burning phase, very high mass stars with more than nine solar masses expand to form red supergiants. Once this fuel is exhausted at the core, they can continue to fuse elements heavier than helium. The final stage is reached when the star begins producing iron. Since iron nuclei are more tightly bound than any heavier nuclei, if they are fused they do not release energy. Likewise, since they are more tightly bound than all lighter nuclei, energy cannot be released by fission. In relatively old, very massive stars, a large core of inert iron will accumulate in the center of the star. The heavier elements in these stars can work their way up to the surface, forming evolved objects known as Wolf-Rayet stars that have a dense stellar wind which sheds the outer atmosphere. An evolved, average-size star will now shed its outer layers as a planetary nebula. If what remains after the outer atmosphere has been shed is less than 1.4 solar masses, it shrinks to a relatively tiny object (about the size of Earth) that is not massive enough for further compression to take place, known as a white dwarf. In larger stars, fusion continues until the iron core has grown so large (more than 1.4 solar masses) that it can no longer support its own mass. This core will suddenly collapse as its electrons are driven into its protons, forming neutrons and neutrinos in a burst of inverse beta decay, or electron capture. The shockwave formed by this sudden collapse causes the rest of the star to explode in a supernova. Supernovae are so bright that they may briefly outshine the star's entire home galaxy. When they occur within the Milky Way, supernovae have historically been observed by naked-eye observers as "new stars" where none existed before. Most of the matter in the star is blown away by the supernova explosion, forming filaments. What remains will became a neutron star (which sometimes manifests itself as a pulsar or X-ray burster) or, in the case of the largest stars (large enough to leave a stellar remnant greater than roughly 4 solar masses), a black hole. Stars are classified by their spectral characteristics. The spectral class of a star is a designated class of a star describing the ionization of its chromosphere, what atomic excitations are most prominent in the light, giving an objective measure of the temperature in this chromosphere. Light from the star is analyzed by splitting it up by a diffraction grating, subdividing the incoming photons into a spectrum exhibiting a rainbow of colors interspersed by absorption lines, each line indicating a certain ion of a certain chemical element. The presence of a certain chemical element in such an absorption spectrum primarily indicates that the temperature conditions are suitable for a certain excitation of this element. If the star temperature have been determined by a majority of absorption lines, unusual absences or strengths of lines for a certain element may indicate an unusual chemical composition of the chromosphere. This even though the actual star colors perceived by an observer may deviate from these colors depending on visual conditions and individual stars observed. In the current star classification system, the spectrum letter is enhanced by a number from 0 to 9 indicating tenths of the range between two star classes, so that A5 is five tenths between A0 and F0, but A2 is two tenths of the full range from A0 to F0. Another dimension that is included in this system is the luminosity class expressed by the Roman numbers I, II, III, IV and V, expressing the width of certain absorption lines in the star's spectrum. It has been shown that this feature is a general measure of the size of the star, and thus of the total luminosity output from the star. class V are called either dwarfs or, more properly, main sequence stars. Under this clasification system, our Sun has the spectral type G2V, which might be interpreted as "a 'yellow' two tenths towards 'orange' main sequence star". The most used designation for the brightest stars is the Bayer designation. Stars designed with this system show a Greek letter, followed by the genitive form of its parent constellation's Latin name. After the letter “omega”, lower-case Latin leters are used, and then, upper case Latin letters. A double star is a pair of stars that appear close to each other in the sky as seen from Earth when viewed through an optical telescope. This can happen either because the pair forms a binary star, i.e. a binary system of stars in mutual orbit, gravitationally bound to each other, or because it is an optical double, a chance alignment of two stars in the sky that lie at different distances. A binary star is a star system consisting of two stars orbiting around their common centre of mass. The brighter star is called the primary and the other is its companion star, comes, or secondary. Binary stars are classified into four types according to the way in which they are observed: visually, by observation; spectroscopically, by periodic changes in spectral lines; photometrically, by changes in brightness caused by an eclipse; or astrometrically, by measuring a deviation in a star's position caused by an unseen companion. A visual binary star is a binary star for which the angular separation between the two components is great enough to permit them to be observed as a double star in a telescope, or even high-powered binoculars. The brighter star of a visual binary is the primary star, and the dimmer is considered the secondary. A particular class of binary stars is the eclipsing binary; in this system the orbit plane of the two stars lies so nearly in the line of sight of the observer that the components undergo mutual eclipses. In the case where the binary is also a spectroscopic binary and the parallax of the system is known, the binary is quite valuable for stellar analysis. Eclipsing binaries so appear as variable stars, not because the light of the individual components vary but because of the eclipses. A star system can be composed by three, or more stars gravitally bounded each other. In this case the system il called multiple star. A variable star is a star which shows a changement of its apparent brightness over time. Many, possibly most, stars have at least some variation in luminosity: the energy output of our Sun, for example, varies by about 0.1% over an 11 year solar cycle, equivalent to a change of one thousandth of a magnitude. Pulsating variables, stars whose radius alternately expands and contracts as part of their natural evolutionary aging processes. Classical Cepheides variables, semiregular variables and Mira variables belong to this subgroup. Eruptive variables, stars who experience eruptions on their surfaces like flares or mass ejections. Young pre-main sequence stars, Wolf-Rayet stars, luminous blue variables and Gamma Cassiopeiae variables belong to this subgroup. Cataclysmic or explosive variables, stars that undergo a cataclysmic change in their properties like novae and supernovae. The extrinsic variable stars are stars where the variability is caused by external properties like rotation or eclipses. There are two main subgroups. Eclipsing binaries, double stars where, as seen from Earth's vantage point the stars occasionally eclipse one another as they orbit. Rotating variables, stars whose variability is caused by phenomena related to their rotation. Examples are stars with extreme "sunspots" which affect the apparent brightness or stars that have fast rotation speeds causing them to become ellipsoidal in shape. The Pleiades star cluster in constellation Taurus is the brightest open cluster in the sky; it lies in a dusty region of the Orion Spur, near the Taurus molecular cloud, and illuminates part of the surrounding dense interstellar matter, generating many small reflection nebulae. An open cluster is a group of up to a few thousand stars that share the same origin and a similar age. They are loosely bound to each other by mutual gravitational attraction and become disrupted by close encounters with other clusters and clouds of gas as they orbit the galactic center resulting in being located within the main body of the galaxy, as well as losing cluster members through internal close encounters. The formation of an open cluster begins with the collapse of part of a giant molecular cloud, a cold dense cloud of gas containing up to many thousands of times the mass of the Sun. Many factors may trigger the collapse of a giant molecular cloud (or part of it) and a burst of star formation which will result in an open cluster, including shock waves from a nearby supernova and gravitational interactions. Once a giant molecular cloud begins to collapse, star formation proceeds via successive fragmentations of the cloud into smaller and smaller clumps, resulting eventually in the formation of several hundreds or one thousand stars. In our own Galaxy, the formation rate of open clusters is estimated to be one every few thousand years. Once star formation has begun, the hottest and most massive stars (stars of O and B spectral class, grouped in a OB association) will emit copious amounts of ultra-violet radiation. This radiation rapidly ionizes the surrounding gas of the giant molecular cloud, forming an H II region. Stellar winds from the massive stars and radiation pressure begin to drive away the gases; after a few million years the cluster will experience its first supernovae, which will also expel gas from the system. After a few tens of millions of years, the cluster will be stripped of gas and no further star formation will take place. Typically, less than 10% of the gas originally in the cluster will form into stars before it is dissipated. Normally the OB associations are named after the constellation in which they lie; the typical designation of an OB asssociation is the nominative case of the constellation + OB + a number. The study of the OB associations is important to understand the star forming processes which take place in the regions of our Galaxy and in other galaxies. 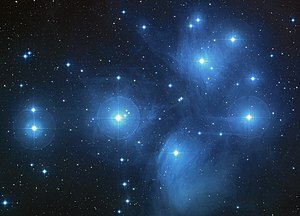 Because open clusters tend to be dispersed before most of their stars reach the end of their lives, the light from them tends to be dominated by the young, hot blue stars. These stars are the most massive, and have the shortest lives of a few tens of millions of years. So the older open clusters tend to contain more yellow stars. Some open clusters contain hot blue stars which seem to be much younger than the rest of the cluster. These blue stragglers are also observed in globular clusters, and in the very dense cores of globulars they are believed to arise when stars collide, forming a much hotter, more massive star. However, the stellar density in open clusters is much lower than that in globular clusters, and stellar collisions cannot explain the numbers of blue stragglers observed. Instead, it is thought that most of them probably originate when dynamical interactions with other stars cause a binary system to coalesce into one star. Many open clusters are inherently unstable, with a small enough mass that the escape velocity of the system is lower than the average velocity of the constituent stars. These clusters will rapidly disperse within a few million years. In many cases, the stripping away of the gas from which the cluster formed by the radiation pressure of the hot young stars reduces the cluster mass enough to allow rapid dispersal. Clusters which have enough mass to be gravitationally bound once the surrounding nebula has evaporated can remain distinct for many tens of millions of years, but over time internal and external processes tend also to disperse them. Internally, close encounters between members of the cluster will often result in the velocity of one being increased to beyond the escape velocity of the cluster, which results in the gradual 'evaporation' of cluster members. In the Milky Way Galaxy there are over 1,000 known open clusters, but the true total may be up to ten times higher than that. In spiral galaxies, open clusters are invariably found in the spiral arms, where gas densities are highest and so most star formation occurs, and clusters usually disperse before they have had time to travel beyond their spiral arms. Open clusters are strongly concentrated close to the galactic plane, with a scale height in our galaxy of about 180 light-years, compared to a galactic radius of approximately 100,000 light-years. M80 in Scorpius constellation, is one of the densest globular cluster known in the Milky Way Galaxy. It is composed by hundreds of thousands of stars. A globular cluster is a spherical collection of stars that orbits a galactic core as a satellite. Globular clusters are very tightly bound by gravity, which gives them their spherical shapes and relatively high stellar densities toward their centres. Although it appears that globular clusters contain some of the first stars to be produced in the galaxy, their origins and their role in galactic evolution are still unclear. It does appear clear that globular clusters are significantly different from dwarf elliptical galaxies and were formed as part of the star formation of the parent galaxy rather than as a separate galaxy. However, recent conjectures by astronomers suggest that globular clusters and dwarf spheroidals may not be clearly separate and distinct types of objects. At present the formation of globular clusters remains a poorly understood phenomenon. It remains uncertain whether the stars in a globular cluster form in a single generation, or are spawned across multiple generations over a period of several hundred million years. This star-forming period is relatively brief, however, compared to the age of many globular clusters. Observations of globular clusters show that these stellar formations arise primarily in regions of efficient star formation, and where the interstellar medium is at a higher density than in normal star-forming regions. Globular cluster formation is prevalent in starburst regions and in interacting galaxies. After they are formed, the stars in the globular cluster begin to interact gravitationally with each other. Most clusters increase steadily in luminosity as this distance decreases, up to a certain distance from the core, then the luminosity levels off. Typically this distance is about 1–2 parsecs from the core. However, about 20% of the globular clusters have undergone a process termed "core collapse". In this type of cluster, the luminosity continues to increase steadily all the way to the core region. Core-collapse is thought to occur when the more massive stars in a globular cluster encounter their less massive companions. As a result of the encounters, the larger stars tend to lose kinetic energy and start to settle toward the core. Over a lengthy period of time this leads to a concentration of massive stars near the core, a phenomenon called mass segregation. Of the globular clusters within our Milky Way, the majority are found in the vicinity of the galactic core, and the large majority lie on the side of the celestial sky centered on the core, between Scorpius, Ophiuchus, and Sagittarius constellations. There are about 150 to 158 currently known globular clusters in the Milky Way, with perhaps 10 to 20 more still undiscovered. Large galaxies can have more: Andromeda Galaxy, for instance, may have as many as 500. Some giant elliptical galaxies, particularly those at the centres of galaxy clusters, such as M87, have as many as 13,000 globular clusters. These globular clusters orbit the galaxy out to large radii, 40 kiloparsecs (approximately 131,000 light-years) or more. Every galaxy of sufficient mass in the Local Group has an associated group of globular clusters, and almost every large galaxy surveyed has been found to possess a system of globular clusters. The Sagittarius Dwarf and Canis Major Dwarf galaxies, two small satellite galaxies of the Milky Way, appear to be in the process of donating their associated globular clusters (such as Palomar 12) to the Milky Way. This demonstrates how many of this galaxy's globular clusters were acquired in the past from other galaxies. A bright nebula (or diffuse nebula) is an interstellar cloud of dust, hydrogen gas, helium gas and other ionized gases. Many nebulae or stars form from the gravitational collapse of gas in the interstellar medium (ISM). As the material collapses under its own weight, massive stars may form in the centre, and their ultraviolet radiation ionises the surrounding gas, making it visible at optical wavelengths. Diffuse nebulae are classified in three major groups: H II regions (emission nebulae), reflection nebulae, and supernova remnants. The Orion Nebula is one of the most famous examples of H II region, a place in which star formation processes generated high-mass stars. These stars produce ultra-violet radiation, that ionizes the surrounding hydrogen gas, which becomes luminous and visible. An H II region is a large cloud of gas and ionized gas of glowing low density in which star formation has recently taken place. The precursor to an H II region is a giant molecular cloud (GMC). A GMC is a cold and dense cloud consisting mostly of molecular hydrogen. GMCs can exist in a stable state for long periods of time, but shock waves due to supernovae, collisions between clouds, and magnetic interactions can all trigger the collapse of part of the cloud. When this happens, via a process of collapse and fragmentation of the cloud, the star formation takes place. The most massive stars born within the nebulae will reach temperatures hot enough to ionise the surrounding gas. Soon after the formation of an ionising radiation field, energetic photons create an ionisation front, which sweeps through the surrounding gas at supersonic speeds. At greater and greater distances from the ionising star, the ionisation front slows, while the pressure of the newly ionised gas causes the ionised volume to expand. Eventually, the ionisation front slows to subsonic speeds, and is overtaken by the shock front caused by the expansion of the nebula. The lifetime of an H II region is of the order of a few million years; radiation pressure from the hot young stars will eventually drive most of the gas away. The whole process tends to be very inefficient, with less than 10 per cent of the gas in the H II region forming into stars before the rest is blown away. Also contributing to the loss of gas are the supernova explosions of the most massive stars, which will occur after only 1–2 million years. Spiral and irregular galaxies contain a lot of H II regions, while elliptical galaxies are almost devoid of them. In the spiral galaxies, including the Milky Way, H II regions are concentrated in the spiral arms, while in the irregular galaxies they are distributed chaotically. Some galaxies contain huge H II regions, which may contain tens of thousands of stars. The reason H II regions rarely appear in elliptical galaxies is that ellipticals are believed to form through galaxy mergers. In galaxy clusters, such mergers are frequent. When galaxies collide, individual stars almost never collide, but the GMCs and H II regions in the colliding galaxies are severely agitated. Under these conditions, enormous bursts of star formation are triggered, so rapid that most of the gas is converted into stars rather than the normal 10% or less. A few of the brightest H II regions belonging to the Milky Way are visible to the naked eye, like the famous Orion Nebula, the Eta Carinae Nebula, and the Lagoon Nebula. A reflection nebula is a cloud of dust or gas which reflects the light of a nearby star. The energy from the nearby star, or stars, is insufficient to ionize the gas of the nebula to create an emission nebula, but is enough to give sufficient scattering to make the dust visible. Thus, the frequency spectrum (and the colour) shown by reflection nebulae is similar to that of the illuminating stars. Many reflection nebulae shows a deep blue colour; this happens because the hot blue stars have enough energy to illuminate small clumps of gas at high distance, at the edge of the giant cloud in which these stars were formed, and because the scattering is more efficient for blue light than red (this is the same scattering process that gives us blue skies and red sunsets). Examples of reflection nebulae are Messier 78 in Orion, and the small nebulous patches surrounding the stars of the Pleiades cluster. The Crab Nebula (Messier 1), in constellation Taurus, is one of the most famous and brightest supernova remnants. The massive star which originated this nebula became visible as supernova on 1054 AD and was recordered by ancient Chinese astronomers. A supernova remnant (SNR) is the structure resulting from the gigantic explosion of a star in a supernova. The supernova remnant is bounded by an expanding shock wave, and consists of ejected material expanding from the explosion, and the interstellar material it sweeps up and shocks along the way. There are two possible routes to a supernova: either a massive star may run out of fuel, ceasing to generate fusion energy in its core, and collapsing inward under the force of its own gravity to form a neutron star or a black hole; or a white dwarf star may accumulate (accrete) material from a companion star until it reaches a critical mass and undergoes a thermonuclear explosion. In either case, the resulting supernova explosion expels much or all of the stellar material with velocities as much as 1% the speed of light, some 3,000 km/s. When this material collides with the surrounding circumstellar or interstellar gas, it forms a shock wave that can heat the gas up to temperatures as high as 10 million K, forming a plasma. Supernova remnants normally show a shell-like shape and many filaments of gas; the shock wave originated from the explosion of a supernova may clean the surrounding environment, creating a superbubble in wich the density of the interstellar medium is very low. A supernova explosion can provide the shock wave required to comprime a nearby giant molecular cloud, creating the environment in which star formation can take place. Examples of supernova remnants are Messier 1 (the Crab Nebula) in Taurus constellation, the Veil Nebula in Cygnus and the Vela Nebula, in Vela constellation. The most famous and best-observed young supernova remnant was formed by SN 1987A, a supernova in the Large Magellanic Cloud that appeared in 1987 (and exploded approximately 168,000 years ago). The most recent remnant in our galaxy is G1.9+0.3, discovered in the galactic center and estimated to have gone supernova 140 years ago. The Helix Nebula, also known as NGC 7293, lies near the southern edge of the Aquarius constellation. At a distance of 700 light-years, this is one of the closest and brightest planetary nebulae known. The central star is the remnant central core of the star which originates this nebula, and it is destined to became a white dwarf. A planetary nebula is an emission nebula consisting of an expanding glowing shell of ionized gas ejected during the asymptotic giant branch phase of certain types of stars late in their life. This name originated because of their similarity in appearance to giant planets when viewed through small optical telescopes, and is otherwise unrelated to the planets of the solar system. Stars weighing more than 8 solar masses will likely end their lives in a dramatic supernova explosion. Planetary nebula may result from the death of medium and low mass stars down to 0.8 solar masses. Medium to low mass stars run out of hydrogen in their cores after tens of millions to billions of years in the main sequence. When they run out of hydrogen, the compression of the core will cause the temperature to rise. The outer layers of the star expand enormously and become much cooler in response to the very high temperature of the core. The star becomes a red giant. The core continues to contract and heat up, and when its temperature reaches 100 million K, helium nuclei begin to fuse into carbon and oxygen. The resumption of fusion reactions stops the core's contraction. Helium burning soon forms an inert core of carbon and oxygen, with both a helium-burning shell and a hydrogen-burning shell surrounding it. Helium fusion reactions cause the star to become very unstable. The helium-burning layer rapidly expands and therefore cools, which reduces the reaction rate again. Huge pulsations build up, which eventually become large enough to throw off the whole stellar atmosphere into space. This ejected gases form a cloud of material around the now-exposed core of the star. As more and more of the atmosphere moves away from the star, deeper and deeper layers at higher and higher temperatures are exposed. When the exposed surface reaches a temperature of about 30,000 K, there are enough ultraviolet photons being emitted to ionize the ejected atmosphere, making it glow. At the end of the process, the cloud has then become a planetary nebula. Planetary nebulae play a very important role in galactic evolution. The early universe consisted almost entirely of hydrogen and helium, but stars create heavier elements via nuclear fusion. The gases of planetary nebulae thus contain a large proportion of elements such as carbon, nitrogen and oxygen, and as they expand and merge into the interstellar medium, they enrich it with these heavy elements, collectively known as metals by astronomers. Subsequent generations of stars which form will then have a higher initial content of heavier elements. Even though the heavy elements will still be a very small component of the star, they have a marked effect on its evolution. Stars which formed very early in the universe and contain small quantities of heavy elements are known as Population II stars, while younger stars with higher heavy element content are known as Population I stars. Out of 200 billion stars, about 3000 planetary nebulae are now known to exist in our galaxy. Their very short lifetime compared to total stellar lifetime accounts for their rarity. They are found mostly near the plane of the Milky Way, with the greatest concentration near the galactic centre. Planetary nebulae have been also detected as members in four globular clusters: Messier 15, Messier 22, NGC 6441 and Palomar 6. However, there has yet to be an established case of a planetary nebula discovered in an open cluster as based on a consistent set of distances, reddenings, and radial velocities. Only about 20% of planetary nebulae are spherically symmetric. A wide variety of shapes exist with some very complex forms seen. Planetary nebulae are classified by different authors into: stellar, disk, ring, irregular, helical, bipolar, quadrupolar, and other types. Although the majority of them belong to just three types: spherical, elliptical and bipolar. The nebulae of the last type show the strongest concentration to the galactic plane and their progenitors are therefore relatively young massive stars. On the other hand spherical nebulae are likely produced by the old stars similar to the Sun. An example of planetary nebula is the Helix Nebula in Aquarius, that is also the biggest planetary nebula in the sky, because of its vicinity. Another example is the Ring Nebula (Messier 57) in Lyra constellation. A galaxy is a massive, gravitationally bound system that consists of stars and stellar remnants, an interstellar medium of gas dust, and an important but poorly understood component tentatively dubbed dark matter. The name is from the Greek root galaxias, literally meaning "milky", a reference to the Milky Way galaxy. The Hubble classification system rates elliptical galaxies on the basis of their ellipticity, ranging from E0, being nearly spherical, up to E7, which is highly elongated. These galaxies have an ellipsoidal profile, giving them an elliptical appearance regardless of the viewing angle. Their appearance shows little structure and they typically have relatively little interstellar matter. Consequently these galaxies also have a low portion of open clusters and a reduced rate of new star formation. Instead they are dominated by generally older, more evolved stars that are orbiting the common center of gravity in random directions. In this sense they have some similarity to the much smaller globular clusters. The largest galaxies are indeed giant ellipticals. Many elliptical galaxies are believed to form due to the interaction of galaxies, resulting in a collision and merger. They can grow to enormous sizes (compared to spiral galaxies, for example), and giant elliptical galaxies are often found near the core of large galaxy clusters. Starburst galaxies are the result of such a galactic collision that can result in the formation of an elliptical galaxy. Spiral galaxies consist of a rotating disk of stars and interstellar medium, along with a central bulge of generally older stars. Extending outward from the bulge are relatively bright arms. In the Hubble classification scheme, spiral galaxies are listed as type S, followed by a letter (a, b, or c) that indicates the degree of tightness of the spiral arms and the size of the central bulge. An Sa galaxy has tightly wound, poorly defined arms and possesses a relatively large core region. At the other extreme, an Sc galaxy has open, well-defined arms and a small core region. In spiral galaxies, the spiral arms do have the shape of approximate logarithmic spirals, a pattern that can be theoretically shown to result from a disturbance in a uniformly rotating mass of stars. Like the stars, the spiral arms rotate around the centre, but they do so with constant angular velocity. The spiral arms are thought to be areas of high density matter, or "density waves". As stars move through an arm, the space velocity of each stellar system is modified by the gravitational force of the higher density. (The velocity returns to normal after the stars depart on the other side of the arm.) This effect is akin to a "wave" of slowdowns moving along a highway full of moving cars. The arms are visible because the high density facilitates star formation, and therefore they harbor many bright and young stars. A majority of spiral galaxies have a linear, bar-shaped band of stars that extends outward to either side of the core, then merges into the spiral arm structure. In the Hubble classification scheme, these barred spiral galaxies are designated by an SB, followed by a lower-case letter (a, b or c) that indicates the form of the spiral arms (in the same manner as the categorization of normal spiral galaxies). Bars are thought to be temporary structures that can occur as a result of a density wave radiating outward from the core, or else due to a tidal interaction with another galaxy. Many barred spiral galaxies are active, possibly as a result of gas being channeled into the core along the arms. There are many other morphologies of galaxies. Peculiar galaxies, for example, are galactic formations that develop unusual properties due to tidal interactions with other galaxies. An example of this is the ring galaxy, which possesses a ring-like structure of stars and interstellar medium surrounding a bare core. A ring galaxy is thought to occur when a smaller galaxy passes through the core of a spiral galaxy. Such an event may have affected the Andromeda Galaxy, as it displays a multi-ring-like structure when viewed in infrared radiation. Despite the prominence of large elliptical and spiral galaxies, most galaxies in the universe appear to be dwarf galaxies. These galaxies are relatively small when compared with other galactic formations, being about one hundredth the size of the Milky Way, containing only a few billion stars. Ultra-compact dwarf galaxies have recently been discovered that are only 100 parsecs across. Many dwarf galaxies may orbit a single larger galaxy; the Milky Way has at least a dozen such satellites, with an estimated 300–500 yet to be discovered. 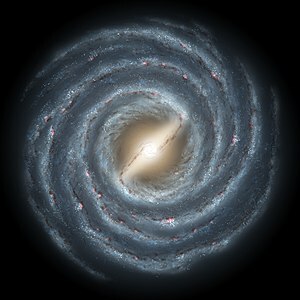 Illustration of the Milky Way Galaxy as seen from an external point of view. The bright bar is clearly evident, as well as the two main spiral arms, the Perseus Arm and the Scutum-Crux Arm. Many small arms and spurs are present, included the Orion Spur. The Milky Way Galaxy is the galaxy in which the Solar System is located. All the stars that the eye can distinguish in the night sky are part of the Milky Way Galaxy, but aside from these relatively nearby stars, the galaxy appears as a hazy band of white light arching around the entire celestial sphere. The light originates from stars and other material that lie within the galactic plane. Dark regions within the band, such as the Great Rift and the Coalsack, correspond to areas where light from distant stars is blocked by dark nebulae. The centre of the galaxy lies in the direction of Sagittarius, and it is here that Milky Way looks brightest. From Sagittarius, the Milky Way appears to pass westward through the constellations of Scorpius, Ara, Norma, Triangulum Australe, Circinus, Centaurus, Musca, Crux, Carina, Vela, Puppis, Canis Major, Monoceros, Orion and Gemini, Taurus, Auriga, Perseus, Andromeda, Cassiopeia, Cepheus and Lacerta, Cygnus, Vulpecula, Sagitta, Aquila, Ophiuchus, Scutum, and back to Sagittarius. The fact that the Milky Way divides the night sky into two roughly equal hemispheres indicates that the Solar System lies close to the galactic plane. The Milky Way consists of a bar-shaped core region surrounded by a disk of gas, dust and stars forming four distinct arm structures spiralling outward in a logarithmic spiral shape. The mass distribution within the galaxy closely resembles the SBbc Hubble classification, which is a barred spiral galaxy with relatively loosely wound arms. The galactic disc, which bulges outward at the galactic center, has a diameter of between 70,000 and 100,000 light-years. The distance from the Sun to the galactic centre is estimated at 26,000 ± 1,400 light-years. The galactic centre harbors a compact object of very large mass as determined by the motion of material around the centre. The intense radio source named Sagittarius A*, thought to mark the centre of the Milky Way, is newly confirmed to be a supermassive black hole. The galaxy's bar is thought to be about 27,000 light-years long, running through its center at a 44 ± 10 degree angle to the line between the Sun and the center of the galaxy. It is composed primarily of red stars, believed to be ancient. The bar is surrounded by a ring called the "5-kpc ring" that contains a large fraction of the molecular hydrogen present in the galaxy, as well as most of the Milky Way's star formation activity. Viewed from the Andromeda Galaxy, it would be the brightest feature of our own galaxy. A map of Milky Way as seen from far Galactic North (in Coma Berenices). The star-like lines center in a yellow dot representing the position of Sun. The spokes of that "star" are marked with constellation abbreviations, "Cas" for "Cassiopeia", etc. The spiral arms are colored differently in order to highlight what structure belongs to which arm. The Perseus Arm is marked in cyan. The Sagittarius Arm is marked in green. The Cygnus (Outer) Arm is marked in purple. The Scutum-Crux Arm is marked in red. *The Orion Spur is marked in orange; it is one of the small-scale structure of the Milky Way. It seems to divide itself into two parts in direction of Puppis constellation, one following the main direction of the other arms and one crossing the Perseus Arm. The Milky Way possesses two major stellar arms: the Perseus Arm and the Scutum-Crux Arm. Others two long arms are the Sagittarius Arm and the Cygnus Arm, sometimes referred as the Outer Arm. Between the Sagittarius Arm and the Perseus Arm there is the Orion Spur, a small arm in which the Solar System is located. All these features lie on the galactic disk, that is the plane in which the spirals, bars and discs of disc galaxies (spirals and barred spirals galaxies) exist. Active star formation takes place in the disk (especially in the spiral arms, which represent areas of high density). Open clusters also occur primarily in the disk, as well as the H II regions. The galactic disk is surrounded by a spheroid halo of old stars and globular clusters, of which 90% lie within 100,000 light-years, suggesting a stellar halo diameter of 200,000 light-years. However, a few globular clusters have been found farther, such as PAL 4 and AM1 at more than 200,000 light-years away from the galactic centre. About 40% of these clusters are on retrograde orbits, which means they move in the opposite direction from the Milky Way rotation. The Milky Way and the Andromeda Galaxy are a binary system of giant spiral galaxies belonging to a group of 50 closely bound galaxies known as the Local Group, itself being part of the Virgo Supercluster of galaxies. Two smaller galaxies and a number of dwarf galaxies in the Local Group orbit the Milky Way. The largest of these is the Large Magellanic Cloud, with a diameter of 20,000 light-years. It has a close companion, the Small Magellanic Cloud. The Magellanic Stream is a peculiar streamer of neutral hydrogen gas connecting these two small galaxies. The stream is thought to have been dragged from the Magellanic Clouds in tidal interactions with the Milky Way. Some of the dwarf galaxies orbiting the Milky Way are Canis Major Dwarf (the closest), Sagittarius Dwarf Elliptical Galaxy, Ursa Minor Dwarf, Sculptor Dwarf, Sextans Dwarf, Fornax Dwarf, and Leo I Dwarf. The smallest Milky Way dwarf galaxies are only 500 light-years in diameter. These include Carina Dwarf, Draco Dwarf, and Leo II Dwarf. There may still be undetected dwarf galaxies, which are dynamically bound to the Milky Way, as well as some that have already been absorbed by the Milky Way, such as Omega Centauri. Observations through the zone of avoidance are frequently detecting new distant and nearby galaxies. Some galaxies consisting mostly of gas and dust may also have evaded detection so far. Current measurements suggest the Andromeda Galaxy is approaching us at 100 to 140 kilometers per second. The Milky Way may collide with it in 3 to 4 billion years, depending on the importance of unknown lateral components to the galaxies' relative motion. If they collide, individual stars within the galaxies would not collide, but instead the two galaxies will merge to form a single elliptical galaxy over the course of about a billion years. In the southern hemisphere the summer sky is dominated by the bright stars of the Orion constellation (to the left), and the stars Sirius (at the top), Canopus (out of sight), and Procyon (right). Orion is one of the best-known constellation, because of its brightness and its symmetric, hourglass-like shape. A constellation is a group of celestial bodies, usually stars, which appear to form a pattern in the sky. Astronomers today still utilize the term, though the current system focuses primarily on constellations as grid-like segments of the celestial sphere rather than as patterns. A star-pattern that is not officially classed as a constellation is referred to as an asterism. One famous example is the asterism known as the Big Dipper, a term unused by the International Astronomical Union (IAU) as the stars are considered part of the larger constellation of Ursa Major. In 1922, Henry Norris Russell aided the IAU in dividing the celestial sphere into 88 official constellations. Typically, these modern constellations share the names of their Graeco-Roman predecessors, such as Orion, Leo and Scorpius. While such celestial formations were originally linked to a mythical event, creature or person, the categorization of the night sky into recognizable patterns was important in early land and naval navigation prior to the invention of the compass during the Age of Discovery. With the technical advancement of astronomy, it became important to move from a pattern-based system of constellations to one based on area-mapping, which led to several historic formations becoming obsolete. In 1930, the boundaries between the 88 official constellations were devised by Eugène Delporte along vertical and horizontal lines of right ascension and declination.from which 37 belong to northen hemisphere and 51 to southern hemisphere. However, the data he used originated back to epoch B1875.0, which was when Benjamin A. Gould first made the proposal to designate boundaries for the celestial sphere, a suggestion upon which Delporte would base his work. The consequence of this early date is that due to the precession of the equinoxes, the borders on a modern star map, such as epoch J2000, are already somewhat skewed and no longer perfectly vertical or horizontal. This effect will increase over the years and centuries to come. The stars within a constellation rarely have any substantial astrophysical relationship to each other, and their apparent proximity when viewed from Earth disguises the fact that they typically lie light years apart. However, there are some exceptions: in the constellation of Ursa Major, the Big Dipper is almost entirely constituted by stars approximate to one another, belonging to a stellar group known as the Ursa Major Moving Group. In the Western world, the sky of the northern hemisphere is traditionally divided into constellations based on those described by the Ancient Greeks. The first ancient Greek works which dealt with the constellations were books of star myths. The oldest of these was a poem composed by Hesiod in or around the eighth century BC, of which only fragments survive. The most complete existing works dealing with the mythical origins of the constellations are by the Hellenistic writer termed pseudo-Eratosthenes and an early Roman writer styled pseudo-Hyginus. In the 2nd century AD, the Greek astronomer Ptolemy described the constellations in great detail in his influential work the Almagest. During the Modern Age and the Age of Discovery, when the southern stars were observed and mapped by Europeans scientists, the southern sky was divided into many small new constellations, created on “empty” areas unknown to the previous astronomers. many of these constellations represent technical instruments invented during XVI-XVIII centuries. Some constellations are crossed by the ecliptic. The ecliptic is the apparent path that the Sun traces out in the sky during the year, appearing to move eastwards on an imaginary spherical surface, the celestial sphere, relative to the (almost) fixed stars. In more accurate terms, it is the intersection of the celestial sphere with the ecliptic plane, which is the geometric plane containing the mean orbit of the Earth around the Sun. As the rotational axis of the Earth is not perpendicular to its orbital plane, the equatorial plane is not parallel to the ecliptic plane, but makes an angle of about 23°27', which is known as the axial tilt (or obliquity of the ecliptic). The ecliptic serves as the centre of a region called zodiac, which constitutes a band of 9° on either side of the ecliptic; the Moon and the planets lie always on this region. Traditionally, this region is divided into 12 signs of 30° longitude each. By tradition, these signs are named after 12 of the 13 constellations straddling the ecliptic. The zodiac constellations, transformed into "signs", are used on astrology.